As long-time readers know, it has been our custom for years at New Liturgical Movement to showcase reader-submitted photographs of beautiful liturgies Eastern and Western, and according to both the Ordinary and Extraordinary Forms of the Roman Rite, particularly for major feasts of the liturgical year or for special occasions in particular communities. We definitely still want your photos! Send them in, send them in droves, as long as they are good photos of reverent liturgies. While, inevitably, we may not be able to use every photo submitted, we need a steady stream of contributions in order to continue this favorite NLM feature. It might be good to recall why we wish to receive and share these photos. First and foremost, we all need encouragement in what is good, true, and beautiful: "Rejoice in the Lord; I say, again, rejoice!" There is so much good happening throughout the Catholic world, and yet many people often feel lost and lonely in the trenches. We all benefit from beholding the beautiful. Second, it stimulates and strengthens our resolve to do the very best we can for the Lord in our own particular locales and situations. All our efforts are ordered Deo optimo maximo, "to God who is the best and the greatest." There is strength in good example and strength in numbers. Third, it gives us a compelling sense of the universality and legitimate diversity of the Catholic Church, when we see so many different places and peoples, rites and ceremonies, vestments and vessels, sanctuaries and styles of architecture, all of them expressive of the inexhaustible richness of the one true Faith. I know that for me personally, and I'm sure for very many other readers, what we see here at NLM over the years not only affords great consolation but provides real inspiration and leads to concrete plans for improvement. 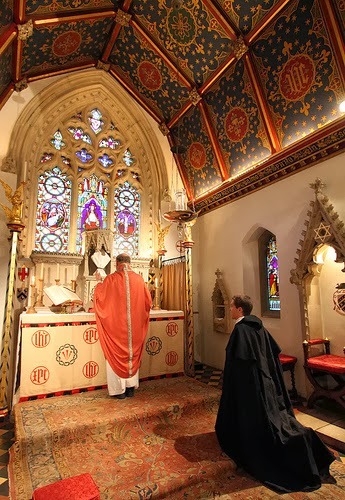 It is truly part of our missionary vocation, the new evangelization that will stand or fall by the solemnity and beauty of our liturgical worship. So, once again, send us your photos (to Ben Yanke).